I have been given the great opportunity to speak at my local church's Sunday morning gathering this week (Dec 28) and have been wrestling through a passage and here is what I've come up with. I hope it touches you the way it did me. 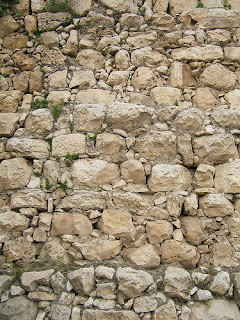 The picture you see is actually a present day photo of the wall Nehamiah built, still standing strong today! Nehemiah 9:38- In view of all of this, we are making a binding agreement, putting it in writing, and our leaders, our Levites, and our priests are affixing their seals to it. In view of what? The entire prayer in chapter 9 is remembering their history with God and all He has done with for them. So chapter 10 starts by listing out a bunch of names of folks who sealed this new agreement/covenant. They bind themselves to these oaths. The funny thing is that as most people are reading this they probably see that they are coming up with all these new things to do for God, but they are just giving themselves over to His Law again. These are not new things they made up they are renewing their commitment to God and His Law (Gen-Deut). Nehemiah gets news from one of his brothers that Jerusalem is in great trouble and disgrace. Now to Nehemiah this meant that God’s people had turned away from God and disgraced Him and the land He gave them. He cries out to God and God leads him all the way to rebuild the wall and we arrive in chapter 10. Now there is this flourishing city of people in a safe place, with a wall, following and practicing God’s Law and spending hours and hours just listening to His Word read by Ezra. I check my watch in some church services. I see other people do the same thing. I have a book shelf that is evidence of me being a nerd at home. I have the internet and so many other resources that these people didn’t have. Seriously they stood around and just listened to God’s Law being read aloud and celebrated! Now, here we are in 2008, almost 2009, and we can barley “find” time to pray or read our Bibles? I think that the typical American Christian is in the same place Nehemiah found Jerusalem, especially this time of year. We have forgotten God, we have let His wall around His people be taken down and disgraced. So maybe we need a little history lesson too. Maybe we need a little reminder too. Maybe we need to go over all God has done for us so that we will turn back to Him and renew our covenant with Him. God created man, man sinned and so God had to throw him out of the garden and could no longer look at him because he was sinful. So God gave man a bunch of laws and such to allow man to have a relationship with Him as long as he was blameless at the time according to the Law. This Law was just pointing to something greater to come. God sent His son to the earth. Jesus lived 33 years on earth. He was as close to God as we can imagine because He was/is God. He was from the beginning. Well God allowed Jesus to be murdered even though He didn’t deserve it. So there Jesus was beaten, bruised, and broken hanging on a cross. So I want you to stop and listen to me for a minute. Whatever you are doing, drawing, texting, looking at your watch, thinking about going back to work, about football, whatever it is stop and listen, like really listen. God has been eternally connected to Jesus, never been apart from Him. Jesus was hanging on the cross and God turned His back on Him, God allowed Jesus to suffer and die. I mean can you imagine having to watch your son die, many of you are parents…imagine that. So God allowed Jesus to die just so He could have a relationship with man again. Now we are given the opportunity to approach a Holy and Righteous God, by believing in Christ. This is huge! I can’t talk specifics, why this doesn’t happen or why this does, but I can tell you that is what God did for us, He did this for all men and only ask for us to put our faith in Christ and He will forgive us. No matter how many times you screw up, no matter how bad you think you are, no matter how little people tell you that you are, God loves you and thinks you are beautiful, you are worth dying for! God totally separated Himself from His son and watched Him die for you. What kind of covenant are we talking in 2008, almost 2009, obviously it isn’t full of these little festivals and such that ancient Israel had. Nope, here it is…Jesus ask you to follow Him. Can we renew our covenant to Jesus? If you have never told Jesus you are willing to deny yourself and follow Him, that you want to know Him and be forgiven, can you do that, can you sign that covenant? In light of all He has done, we should be lining up to do so now. Like the Israelites in Nehemiah we need to renew our agreement with Jesus (God)!